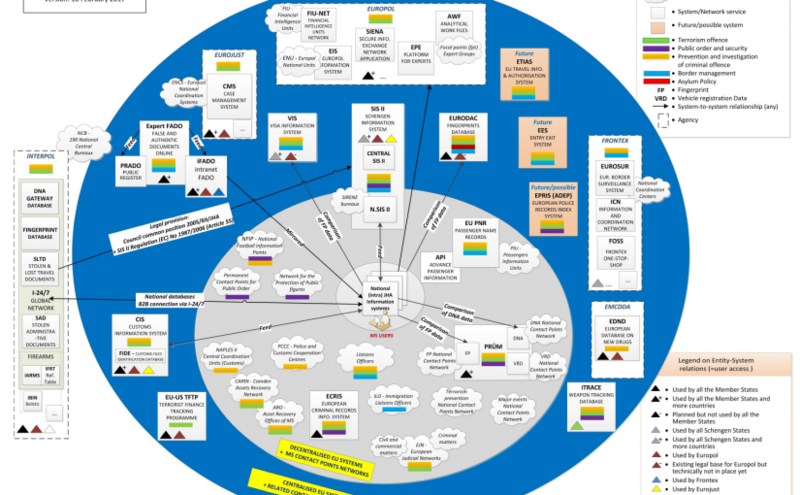 The Council of the European Union has published a diagram of all of information systems in the realm of justice and home affairs. This overview includes databases operated by the police, customs and agencies, as well as by Interpol. It also features the agreement between the EU and the USA on exchanging data regarding financial transactions. A new diagram is intended to make it easier for delegations from European Union member states to get to grips with the data landscape in the area of justice and home affairs. This was against the backdrop of the High Level Expert Group on Information Systems and Interoperability launched in the summer of last year, which is tasked with the development of proposals to improve file-sharing. The group is made up of members of the Commission and the member states, as well as external “experts”. All existing information systems are to be assessed and tested for their usefulness. Uniform formats that are developed by the Bundeskriminalamt (Federal Criminal Police Office) and the police agency Europol are envisaged. A further aim is to improve the quality of the data supplied. A problem that the authorities run up against when dealing with decentralised systems is the fact that the member states often use different software programmes. The Expert Group is working to assess the feasibility of centralising systems in such cases. Amongst the most questionable projects from a data protection point of view is the development of “EU-wide integrated biometric identity management”. The objective of this undertaking is to consolidate four current databases (as well as a fifth that is in the making) – the Schengen Information System (SIS), the fingerprint database Eurodac, the Visa Information System (VIS), the decentralised European Criminal Records Information System (ECRIS) and the Entry/Exit System (EES), which has yet to be adopted – to create a “biometric core data system”. This “common repository of data” is to be developed by the European Agency for the operational management of large-scale IT systems (eu-LISA). The European Commission has hailed the project as the “most ambitious long-term approach to interoperability”. Moreover, the Commission has announced the development of the “Single Search Interface”, which is intended to allow security authorities to call up the information that they require “at the click of a mouse”. Further databases are in the pipeline alongside biometric systems. A year ago, the Council and the European Parliament adopted the directive on the use of Passenger Name Records (PNR data), and the Federal Government has recently submitted a legislative proposal for its implementation. An additional EU-wide European Travel Information and Authorisation System (ETIAS) is intended to add information regarding intended border crossings to existing databases. Travellers are required to complete a form on the Internet and provide information as to their intended stay. A software programme checks this data against the relevant databases and searches for suspicious travel patterns. If this “prior check” turns up no results, travel is authorised. The High Level Expert Group on Information Systems and Interoperability published an interim report in December last year. The final report, announced for July, is scheduled to appear by as soon as April.